TraknProtect, a real-time inventory tracking and analytics software platform for hotels, announced the appointment of a new member to its advisory board, Amadeus Hospitality's Sarah Taveprungsenukul. (AUGUST 17, 2017) – TraknProtect, a real-time inventory tracking and analytics software platform for hotels, announced the appointment of a new member to its advisory board, Sarah Taveprungsenukul. The addition will support the company’s strategic and aggressive growth in the hospitality industry. Taveprungsenukul is a seasoned Sales Director with Amadeus Hospitality. TraknProtect originally caught Taveprungsenukul’s attention during the company’s integration process with Amadeus’ HotSOS solution. 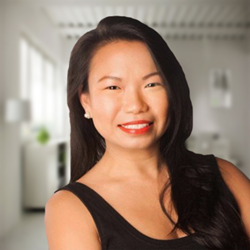 She and Batra quickly recognized that Taveprungsenukul’s knowledge and experience in the hospitality industry and with its leading technologies would allow her to provide valuable commercial insights into its sales and partnership efforts. TraknProtect’s advisory board, originally founded in 2013, comprises a team of subject matter experts and business veterans in the technology and hospitality industries. Taveprungsenukul joins the advisory board’s current members David Millili, Anil Harjani, Mark Wells, Anjali Gurnani, Sunil Gaitonde, Deepak Goel, Arun Sobti, and Samer Khanafseh. TraknProtect is the only inventory tracking and analytics platform for hotels, providing real-time location of what hotels have and where it is via its proprietary app. As a result, TraknProtect is helping hotels increase guest satisfaction and employee productivity. Through data analytics, TraknProtect helps hotels save significant capital costs by making smarter inventory purchasing decisions. TraknProtect surpasses client expectations by providing an end-to-end inventory tracking solution. For more information, please visit http://traknprotect.com/.